Thursday Thoughts - Where do you take your product photos? Since one of the key things to successful online sales is to have good product photos, I'm always interested in seeing different photo locations and setups. When wandering around the blogosphere, I ran across Life in the Thrifty Lane and she had a post that included a photo of where she takes her product pictures. I thought it would be fun to see how everyone else is doing their product photos. I have used several different locations in the 15 months I've had my shop. During the summer months, I like to take pictures outside and use the natural sunlight. My favorite props are a large rock and a Navajo moccasin. When the weather cooled down, I tried doing photos on my front porch so I could still take advantage of natural light. During the colder months, I'm at work during daylight hours, so I've tried a few other things. 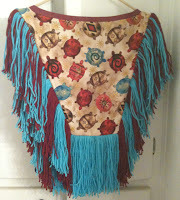 I sometimes drape a blanket or other fabric on the couch and prop the product up there. We have a female upper body form that I can hang from a cabinet door in the kitchen to do photos of necklaces. I usually have to pin fabric up behind it to prevent seeing the kitchen. Other props I've used are interesting glass containers, a pewter stein, stuffed animals, and even a cupboard door purchased from Ikea's "as is" area. 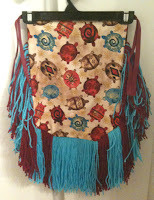 Take a look through some of the items in my shop to see how they turned out. Any constructive criticism is welcome. Share your photo locations/setups here. Link to a blog post or a photo on Flickr. I'll leave this up for a week to see what we get. For some reason, I really like dragonflies. I really have no idea when I started to like them or why, but they really appeal to me in designs. 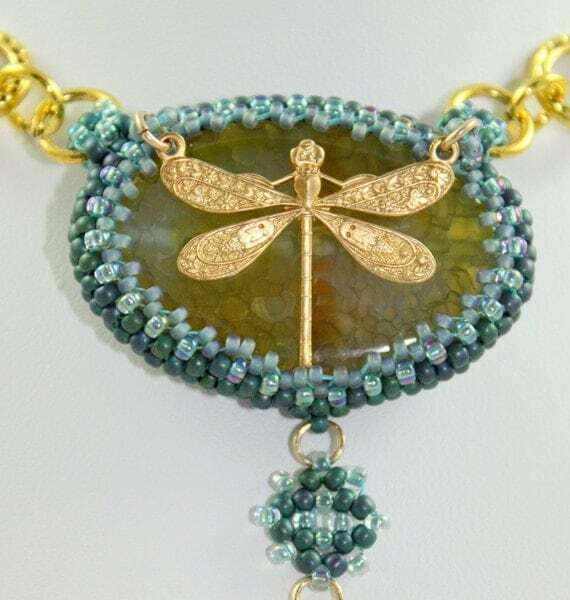 Combine the dragonfly with some beadwork, and I fell in love with this necklace during last week's Etsy Wednesday by Michele of Beauty in the Eye Handweaving & Jewelry. Now comes the hard part - do I keep it for myself, give it as a gift, or put it in my Etsy shop? My husband has been putting his foot down lately about making sure we put things in the shop to sell. If you're wondering, "why don't you just make another one?" you obviously haven't done something like this before - not from a pattern and much more time consuming than making a bracelet or earrings. For you non-tatters, check out tat-ology, a blog by a certified master tatter. 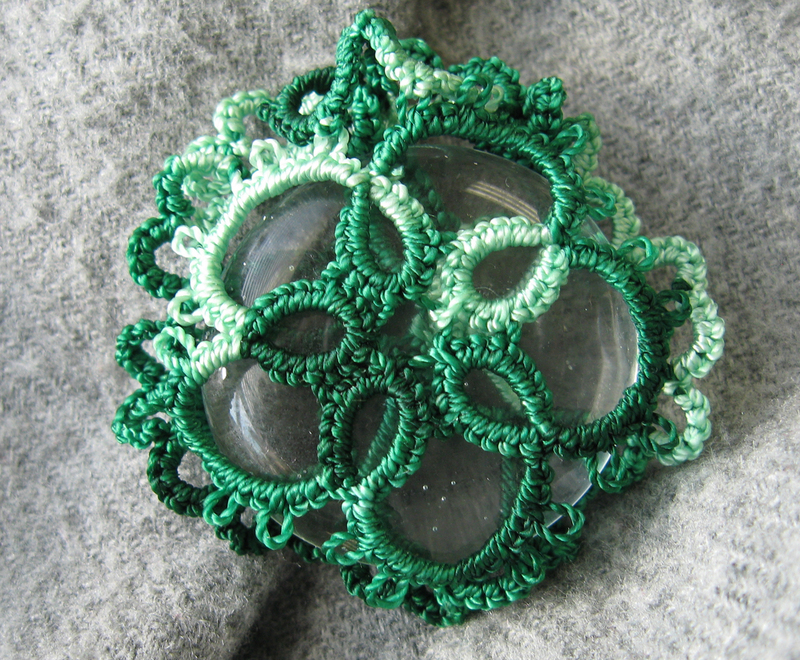 For my tatting friends out there, I'd love to hear what inspires your tatting creations. I blame my husband for ending up at the Scrapbook Expo over the weekend. That's definitely an odd thing to say since most husbands probably aren't thrilled about their wives going. The reason he wanted to go is that he went to the last one and liked seeing the demos and supplies there. His descriptions didn't quite prepare me for the site I was about to behold. We go to lots of expos during the year and most are set up pretty much the same way. The Scrapbook Expo is completely different. Vendors' booths are set up around the perimeter of the space and the center is filled with row upon row of tables set up for people to "work" while at the expo. The tables are available to those who pay a premium price and are soon filled with every scrapbooking supply imaginable. There were a few thousand women there and only about five men (other than those working the booths). Those poor guys were pretty much attached to their wives and mostly there to hold bags and purses. The best part for me was checking out all the different products. It's worth saving up your money for this event to take advantage of the amazing deals on supplies. We're always on the lookout for good deals on paper and tools that will help with using the Cricut. I was hoping to see demos of other cutting machines, but Cricut was the only one there. I'm guessing it was because Provo Craft was a major sponsor. The interest in the Cricut seemed to have suffered from the latest legal developments. Despite using the same materials, I have to admit I don't have much in common with scrapbookers. I don't have the patience or the money to get that fancy with my photos and keepsakes. The trend toward digital scrapbooking is probably more my style - do the fancy schmancy stuff on the computer and then print it out and put it in a book. All that other madness is just lost on me. The coolest display we saw there was some gorgeous gowns made of paper. The pictures don't quite do them justice. P.S. Please don't take offense at my view of scrapbooking. It's just not my thing. Don't you just love checking out new Etsy shops? Heather Thorkelson opened her shop, heatherlyone, only a little over two months ago. Something unique about Heather is that she tries to make jewelry and other items out of environmentally friendly and natural materials that are sustainably produced. She also tries to support social justice and women's empowerment whenever possible. She says, "I want my work to reflect my love for a healthy planet, where we respect, reuse and recycle as much as possible." Even though her shop's been open a short time, she's already had 14 sales, most of them in the past month. Her buttons made from avocado pits seem to be the most popular and I can see why - they are unique and beautiful! Make sure you use all four feature spots at the top of your shop. Under "Your Account," where all your items are listed, you can click on the stars next to items to indicate which items to feature. If you select more than four, the first four of them will be featured and if one of them sells, the next starred item will be featured in its place. Most of your product photos are great. 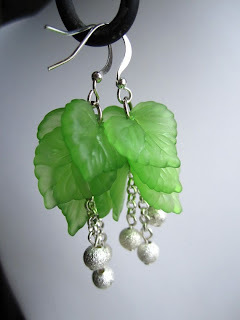 This one of the green leafy earrings is a good example of how to do things in a photo. No clutter, the earrings are the focal point, and the parts out of focus make it stand out even better. I've enjoyed your product descriptions. You're giving measurements and information on the materials used. What I really liked was the little emotional hooks you've added to the descriptions, making it a more personal conversation with your potential buyers. Your product categories could be revised a little. I struggle with this one, too. Most of us tend to add new categories as we create new items and forget to make sure all the categories go together. Try to either choose categories by materials used (wood, feathers, seeds, etc.) or by the type of item (earrings, necklaces, apparel, etc.). Heather's shop seems more like an art gallery than a store. I like her commitment to the planet. Are any of you doing something similar? Upcycled/recycled? Sustainable materials? Supporting a particular group or purpose? 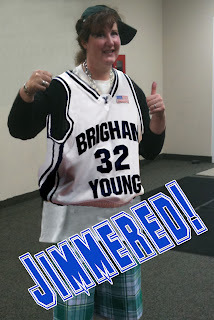 Thursday Thoughts - It's Jimmer Time! In case you didn't know, I live in Utah and I'm just on the other side of town from Brigham Young University (BYU). We've (of course the entire state is taking credit for this) been absolutely blessed to have the top college basketball player in the country on the BYU team. Jimmer Fredette grew up back east, but now that he's put in his time at BYU, the state of Utah will claim him forever (I'm not exaggerating). Jimmer-mania has swept the city, state, and country. This kid is amazing! What's even more amazing is that he's humble enough to make sure people remember that it's a team effort and he's pretty good about sharing the ball during the games rather than keeping it to himself. He's getting praise for his talents from every possible direction, too. I think people are happy to cheer for a talented player who is also a really great human being as well. One of the perks of having some Photoshop skills is that I can do really silly things to prank my friends. I work with the most amazing person who also happens to be our chaplain at Heritage. For Halloween last year she dressed up "gangsta" style. I took that photo of her and combined parts from a Jimmer photo. The result - Chaplain Tami has been Jimmered!! I am sometimes known for wearing really unique or funky earrings, so the shop that stood out to me during last week's Etsy Wednesday was MUKLUK. 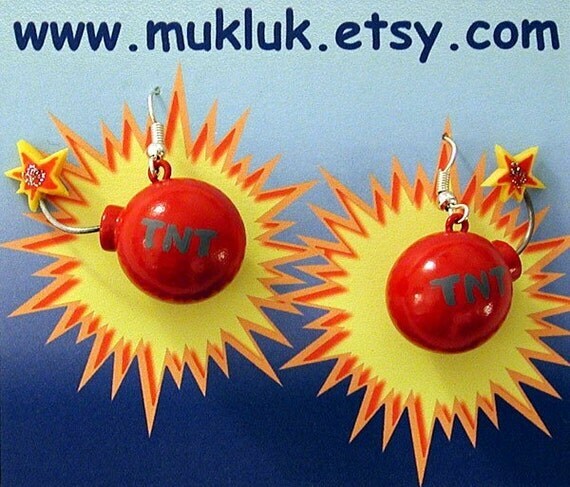 There is also some serious jewelry in the shop, but I love these cherry bomb earrings. They transport me back to my childhood and watching Road Runner and Coyote cartoons. I apologize to regular readers for being a little hit or miss with the blog lately. Part of the "fun" of juggling a full time day job with other activities and a small business on the side is that there are days where you just can't get everything done that you had planned. Full time job stuff - I'm trying to keep on top of regular office work as well as round up golfers for a charity golf tournament and find some sponsors and donations for the auction. Add to that our student musical production (way beyond anything you've seen before) where I am coordinating the rehearsal schedule, designing the poster and playbill, and dealing with crises as they arise. Women's Business Network - I'm on the Board and in charge of communication and participation for this growing organization and we are planning a fantastic event for later this year. Tutoring - I am tutoring two different students for a total of five hours each week. This is very fulfilling, but fitting this in with my schedule and the students' schedules is a huge challenge. Native and Pilgrim - Yes, I still work on our little business. Promoting our shop on some blog linky lists gets us a few more shop visitors. We are continuing to develop our "brand" and have some opportunities coming up this weekend to stock up on supplies, learn techniques, and connect with our Native American community. We are beginning to wish we had gone with the Silhouette cutter rather than the Cricut, but we don't have the resources to make that kind of investment right now. Family - Hard to believe, but my family is still there for me. I've been teaching my hubby to use Google Reader to keep up with some interesting blogs. My sons are nice enough to smile politely when I show off the latest thing I'm working on or tell them some exciting idea. Our beagles are the happiest to see me when I get home. It might be because I'm the one who feeds them, but I choose to believe they love me more than life itself. Thanks for letting me check in with you. 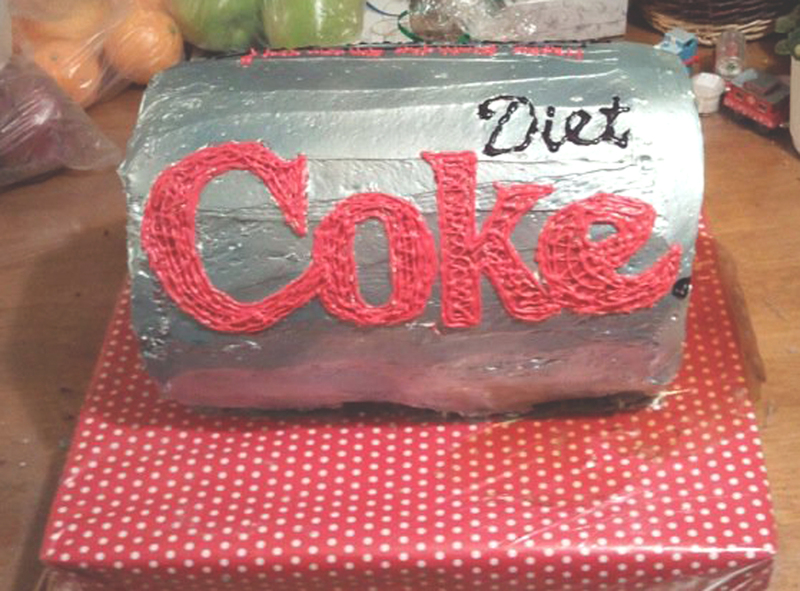 I've enjoyed everyone's comments on the Diet Coke cake, tatting, Etsy, and everything else. What are all of you working on right now? The Cricut cutting machine has been making the news on many blogs recently because of some legal issues. Provo Craft, the owner of the Cricut franchise, has been pursuing some of the companies who make software that can be used to control the Cricut. I'm not going to go into all the details or have a big debate over it since you can easily find that information on other blogs. Why do I bring this up, then? Purchasing the Cricut was a huge investment for us and we are depending on it to help our business. The official way of using the Cricut is to use various cartridges with patterns for cutting. Because of the kind of work my husband wanted to do, we would have to find a third-party software that would allow us to have the Cricut cut our original art work. That's when we found Sure Cuts a Lot (SCAL). Cartridges work great for a lot of people, but it's just not our thing. One of the other companies that makes software similar to Sure Cuts a Lot has settled with Provo Craft and will no longer be able to sell software compatible with the Cricut. The maker of Sure Cuts a Lot is also being sued and will most likely suffer the same fate. Even if you don't want to come up with your own art, there are some fun blogs out there offering free art or cutting files and there are sites that sell some of the most amazing creations that you can cut on your machine. If this is something you have thought about doing, you'll want to buy the SCAL software before it has to sever its ability to connect with the Cricut. Here are some great resources to check out. Purchase the SCAL software here. By the way, SVG is a type of file format (like PNG, JPG, GIF, etc.) that works well with the SCAL software. It's also good to understand that there are several other companies who also manufacture cutters, so make sure you do your research before investing in a machine. Go over to this blog if you want to try to win a Silhouette cutting machine. Wendy Caesar is a single parent of a 17 year-old girl. She works full-time and is very active preaching and teaching in the community. She told me she has at least three shops, but she mostly promotes Tiflo Gifts and More. She has had the Etsy shop for a few years, but has only been really active with it since January 2011. 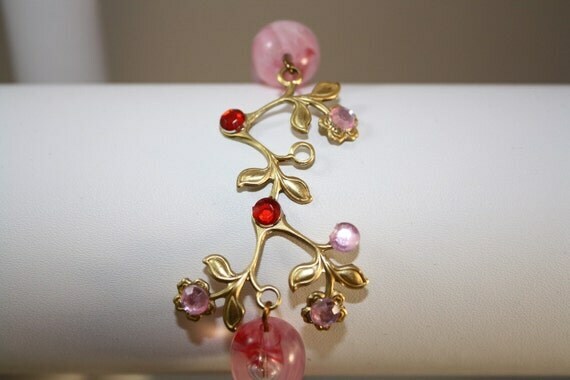 I love making jewelry and was involve in it 16 years ago, after my daughter was born I took a very long break a 16 year break so I just got back into making jewelry. What I notice since I started is that my jewelry sells very fast at home shows but comparing that to being on the website it is quite difficult to get a sale. I get comments all the time about how beautiful my jewelry looks and people even says you should have no problem selling your jewelry. That is the frustrating part is the waiting for the online sale. The name Tiflo was a combination of a favorite puppy I had when I was pregnant with my daughter and the part of my daughter name. This bracelet is one of my favorites from Wendy's shop. It is reasonably priced and absolutely gorgeous. She will even ship it for FREE! I can't believe she hasn't sold it already. Write more about your product in the product description area. I know it's hard, but try to create a background story or something really descriptive that will captive the potential buyer. Jewelry is a tough category, so you have to work hard to stand out. Adding more descriptive terms will help. Think of who would wear the item. Does it appeal to people who like earthy things, goth, Victorian, bold colors? Is it elegant, dainty, chunky, wild, unique, simple, funky, playful? Don't be afraid to look around at other jewelry listings to get some ideas on how to write descriptions or think of new tags. I'm always having to push myself to think outside the box when listing new items and I still fall short. I wrote about the creative use of tagging in an earlier post. Selling online can be tough because of all the competition. Everything Etsy posted this great article about 20 Tips for Selling on Etsy. I think Wendy has already done well with photography and pricing, things that most people struggle with in the beginning. With a little help, I think Wendy will get her first online sale really soon. If it makes you feel any better, I've only had one sale so far in 2011. Maybe my other readers will have some advice for you, too. Thursday Thoughts - What's Really Valuable to You? Japan's massive earthquake, tsunami, constant aftershocks, and nuclear plant problems have been dominating the news over the last week. I have a friend from college who lives in Ibaraki prefecture in Japan and reading his detailed description of the events made me very emotional. There are so many people in the most damaged areas who have literally lost everything they own other than the clothes on their backs. After seeing a photo of a woman collapsed on the ground and sobbing at the sight of her home that was crushed to bits and pieces, I started thinking about what it might be like to go through that kind of loss. The people in the Sendai area couldn't possibly prepare for the kind of devastation that hit them. It's good to prepare, but there will always be things you can't prepare for. For most of the people there, all they really care about is the safety and well-being of their friends and family members. There have been some amazing miracles where rescuers found a man floating on his roof 10 miles out at sea two days after the big quake and tsunami and the baby found alive in the rubble after three days. Even the area where I grew up on the southern Oregon coast had damage from the Tsunami. Boat harbors were ripped apart and pieces of the dock as well as the boats moored to them floated out to sea. I saw video of boats being slammed against the rocks. Although not as tragic as the damage and loss of life in Japan, it's still shocking to see disaster hit a place you're familiar with. With all the ups and downs in my own life, I can honestly say that as long as I have my family and friends, I can survive. Things are just things and I could learn to live without them. If you've been on Etsy recently, you've probably noticed that a lot of sellers are doing what they can to help Japan's recovery efforts. Some are donating a portion of their sales and others are donating items to be sold completely for charity. It's nice to see that we're all trying to help each other. Today is also St. Patrick's Day. 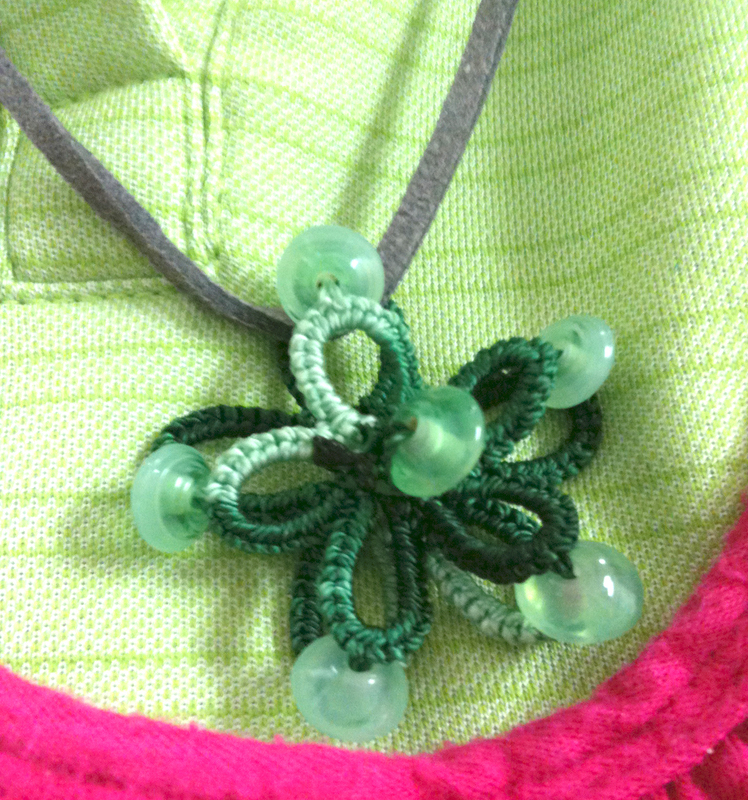 I'm not really big on wearing green, but I managed to make the best of a tatting "mistake" I made. While I was doing all those tatted glass gem pendants, I tried something new and used beads on the connections around the outside edge. The result was a motif that was too small to squeeze the glass gem into. It actually looks really nice on its own and I'm wearing it today as my official green. Welcome to ETSY WEDNESDAY! Market or promote your online store by linking to our party. Once you link up your shop, don't forget to spread the word to other sellers as well as your friends who are in the mood for shopping. Don't worry, you can still link up even if you're on Artfire, Zibbet, 1000 Markets, Folksy, etc. Wondering what a Linky Party is or how it works? Read this explanation for help. My favorite shop from last week's Etsy Wednesday was MidWest Mermaid. 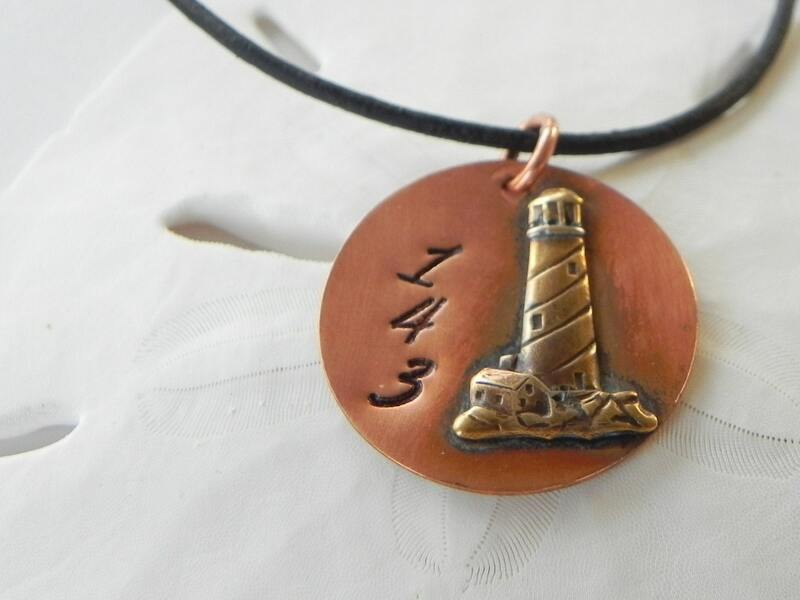 Gigi Galato lives in Ohio and creates beach inspired jewelry. I guess I identify with her because we both are living inland and miss our beloved ocean. Mine, the Pacific, and hers, the Atlantic. This "I Love You" pendant really captured my heart. Make sure you go to her shop and read the fascinating story behind it. I've been so focused on other kinds of arts and crafts that I haven't touched my sewing machine in ages. When I went to look for it, I discovered that my hubby had stored it in the shed in the backyard. The nerve!! After lugging it back into the house, I had to wipe the dust off and then start looking for the thread, sewing machine accessories, and so on. Not having a place to set up the sewing machine permanently is part of why I don't sew very often. Hauling everything out and setting it up discourages me every time. There was no way I could let myself get discouraged from this project, however. My little nephew needed a grass dance outfit for his school's powwow. In case you're not familiar with Native American culture, a powwow is a gathering of sorts that involves singing, dancing, and socializing. Contest powwows have Native American dancers competing to win their dance category and sometimes have contests for the drummers/singers as well. Other powwows are more social in nature and the dancing is more for fun. PowWows.com has great information about all of this as well as a calendar of upcoming powwows in case you want to attend one. 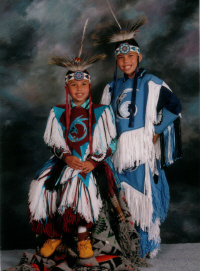 Both of my sons were grass dancers, so I am very familiar with the dance and the outfits (or regalia) that go with it. One of the key parts of a grass dance outfit is the fringe....lots and lots and lots of fringe. On the very first outfit I made, I had no help or guidance and tried holding cut fringes of yarn against the fabric as I fed it into the machine. Not only did it clump in spots, but the yarn fell off bit by bit as my son danced....so embarrassing! Fortunately, a dear friend helped me through the process the next time and we were able to create dance outfits my sons could be proud to wear. For my nephew, there wasn't a need for as elaborate of an outfit since he won't wear it as often. My boys used to compete in probably a dozen powwows each year. The tough part about making anything for a small child is that they tend to outgrow it quickly. Hopefully, this kid will still be able to fit his outfit next year as well. My dear, wonderful, heroic husband cut and tied all the fringe for me (I love you, honey!). Tying each bit of fringe to a long string makes everything stay put when you go to sew it. Then I sandwiched the fringe between the front and back of the cape and apron to sew it. It's not terribly fancy, but I like it. I hope my nephew does, too. He loves turtles....in case you couldn't tell from the pattern on the fabric. When you make things with your own hands, it doesn't take long to figure out that mistakes can and do happen. 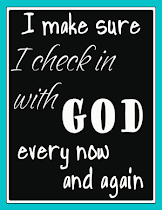 Depending on how big the mistake is, you may be able to fix things or you may have to start completely over. Starting over can be very expensive if you're using costly materials. Even the amount of time invested could lead to missed sleep, missed work on other projects, etc. That old carpenter's adage of "measure twice, cut once" is important to apply to everything you do. It's not uncommon for those of us in the handmade world to experiment a little and try new things. I know that my hubby, Cricut Man, uses paper destined for the trash can to try out his ideas so he can save his better materials for the actual project. I'm always amazed at how many different attempts it can take for him to get it "just right." He is definitely a perfectionist! Thursday Thoughts - What will happen to your shop if you become incapacitated? No matter how invincible you think you are, disaster is inevitably around the corner. My own personal example is when I totaled my truck in an accident and ended up with a broken foot. I did a good enough job on breaking it that the doctor installed several pieces of metal jewelry to put the bones back together (2 pins, 2 plates with screws). That experience had me out of commission for a good chunk of time. It took a few weeks before I could even sit at a computer and a couple of months before I could walk. Over the last couple of months, I've stumbled across some good posts about this very thing. Darren Rowse of ProBlogger.com explained, "As a solo entrepreneur, I realized that much of what was needed to run this business was locked up in my head—a dangerous thing if something happened to that head!" His advice about creating a "Blogging Will" applies to your business as well. 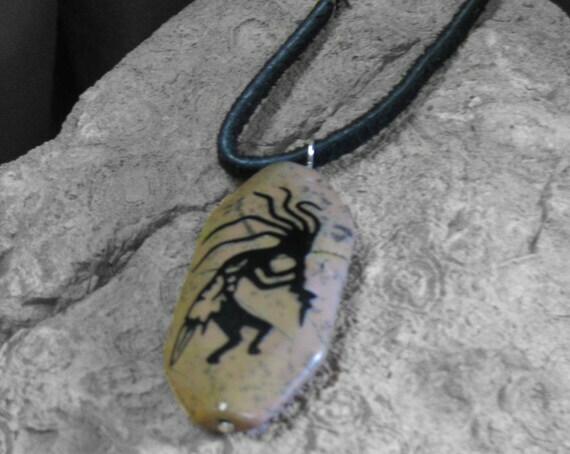 One of my favorites from last week's Etsy Wednesday was from Wandering Jeweler. Canadian Kerry Bast opened this shop six months ago. Kerry is from my favorite part of Canada - British Columbia. 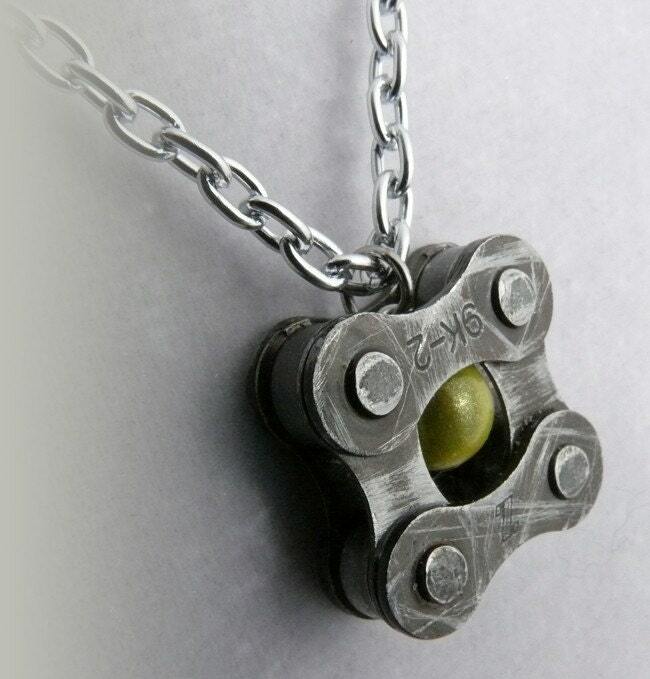 As someone who likes to upcycle, I instantly fell in love with her necklaces made from bicycle chains. I've had so many great comments from readers and from friends about tatting. 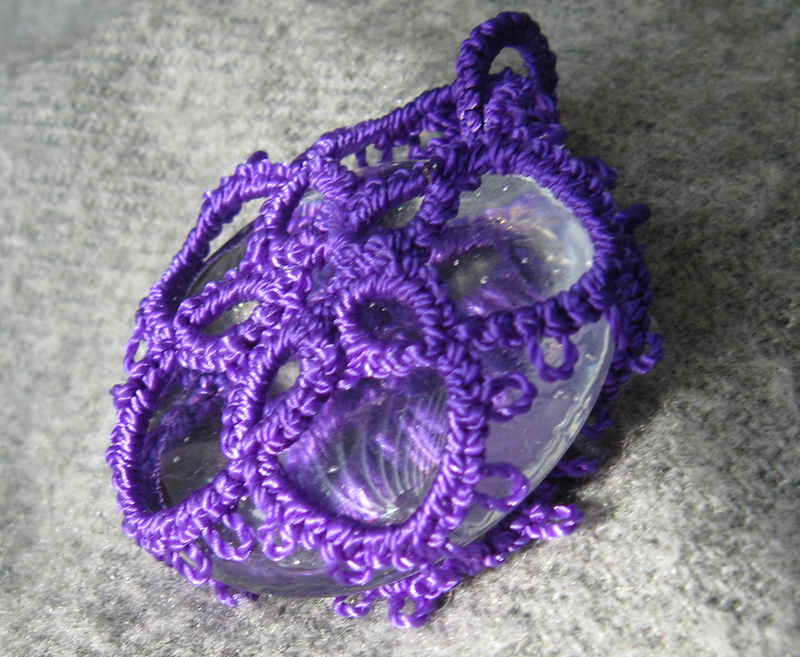 There are a lot of curious people out there and I know they'd like to see more tatting. Those who don't tat probably don't realize how large the online community of tatters truly is. For today's Tatting Tuesday, I want to fill the page with tatting....with the help of my tatting friends, of course. As long as I'm paying for Linky Tools, I might as well use it as much as I can. Fellow tatters, link up your tatting here. I'm not going to set any rules. You can link to the tatting in your shop or on your blog. Link as many different items as you want. Let's show everyone that tatting is not a dying art! Monday Madness - Are you thinking of leaving Etsy and trying to sell on your own? Do you ever find yourself tempted to let go of your shop on Etsy and just sell your products on your own website? This thought pops up here and there as people wonder if Etsy is worth the fees they're paying. It's always tempting to cut out anything that skims money from your profits, but would you have as many sales without Etsy's advantages. Go into your tracking service (ie. Google Analytics) and set the time period for February 1 to February 28. I was hired to design my first modern wedding invitation and it was a very interesting experience. When I got married over 20 years ago, there weren't a lot of options for invitations. We ordered ours from a catalog and had to wait several weeks for them to be delivered. You could choose a color that fit your color scheme and there were a few options for some faded graphics along the edge or in the background. I don't remember much choice for fonts either. The invitations were also pretty expensive. When I was hired to do this modern wedding invitation, I took a look around the Internet and was amazed at all the variety out there for invitations. It seems like a lot of young couples are straying from the traditional types of invitations and showing off their personalities more. The couple I was working with liked some different designs that had love birds in a tree. The bride's mother worked with me on wording. 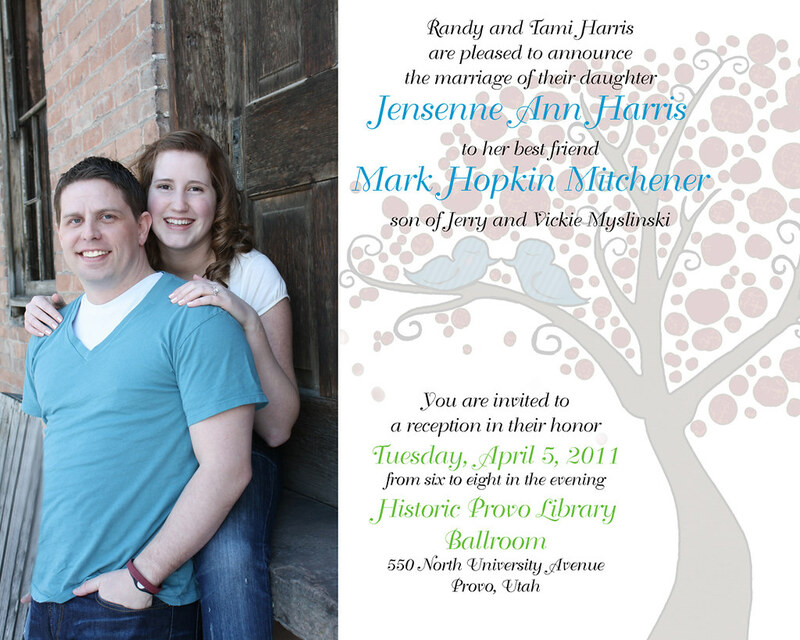 Do you realize how much you learn from how the wedding invitation is worded? How the bride and groom's parents are listed on the invitation tells you who is hosting the event (paying the bill).